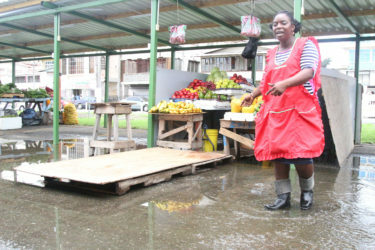 Recent rainfall and inadequate drainage have left some vendors selling along the Merriman Mall, between Orange Walk and Cummings Streets, waterlogged. As a result, they have either had to move from their original spots or use makeshift bridges to enable customers to access their stalls without having to walk in the water. A very vocal Melissa Roberts said yesterday that she is tired of the situation. She explained that every time the rain falls, water would accumulate in front of her stall. 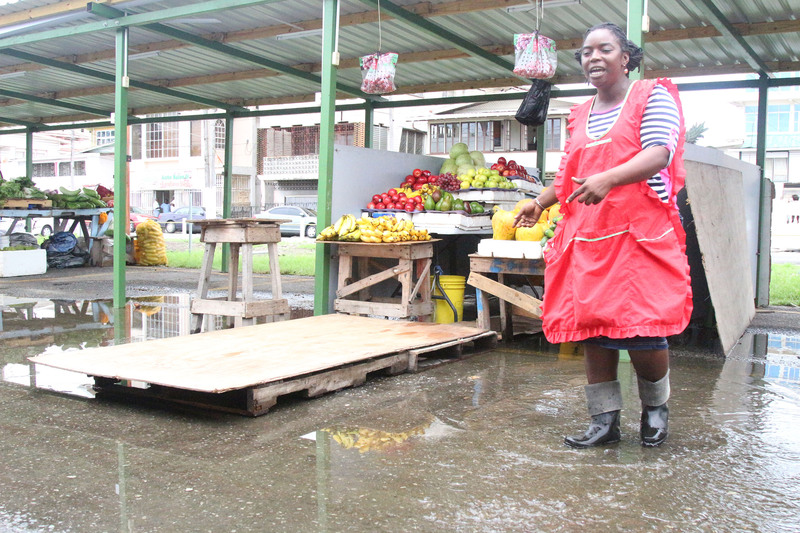 Roberts told Stabroek News that although she placed a makeshift bridge to her stall to prevent customers from walking in the water, they have opted to stay away altogether. Roberts was the only vendor with water in her stall when Stabroek News visited. She noted that water in her stall also prevents her from staying in the stall. During its visit, this publication met her sitting outside of the stall. Other vendors surrounding Roberts added that from the time customers see the pool of water, they usually don’t bother visiting. Roberts said that if the situation continues, she would not pay City Hall the daily rental fee as the water is preventing her from getting sales. Another vendor, Anjanie Ramnarine, said she had to move to the end of the mall to find a dry spot. She said buyers are staying away from her site as a result of the water in front of Roberts’ stand. Vendors said when they complained to the market authority, they were told to source their own cement and sand to fill up the area to prevent flooding. Traders who have operated for decades along the mall have continued to complain about the recent changes at the site, while City Hall has claimed it is unaware of the issues affecting them.